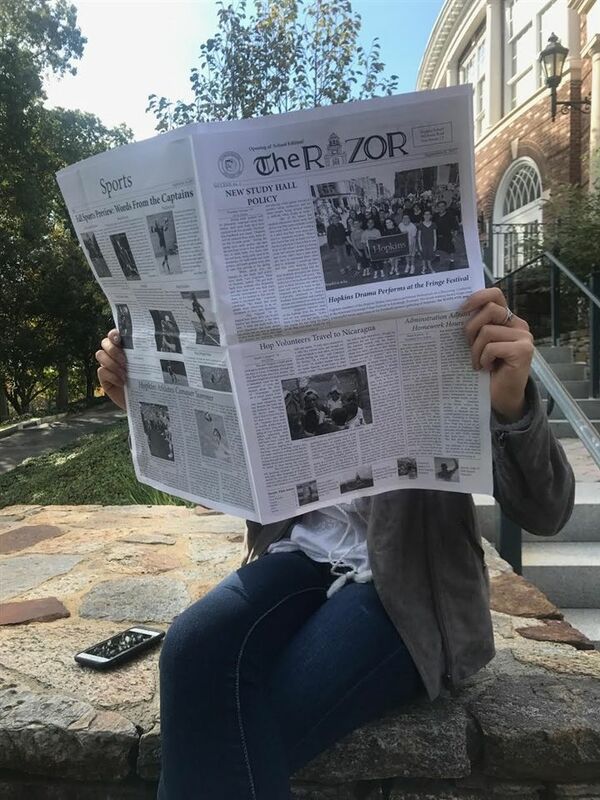 Allie Sokol '18 reads the September issue of The Razor. The Razor has been a consistent and dependable feature of Hopkins School for longer than any of us can remember...but when did it all begin, and how? First issued on November 6, 1945, The Razor was spearheaded by three determined students – T. Hopkins, P. Bastian, and Editor-In-Chief J. Munson – with ample writing experience and a broad knowledge of the general interests of Hopkins’s student body. The boys decided that a school of their size should have a weekly newspaper, and began the costly and time consuming task of consulting printers and selecting photos for publication, which totaled about fifteen dollars per issue. In order to match the printing expenses, the students had to sell over 150 copies of the paper at 10 cents, though they also offered the option of prepaying a subscription fee of $2.50 for 25 issues per year. The Razor consisted of four main sections:“The Razor’s Edge,” “The Gay Blade,” “The Mug,” and “The Strop.” “The Razor’s Edge” headed the editorial articles, while “The Gay Blade” advertized popular movies or upcoming theatre productions, such as "The Hurricane" at the Bijou or “The Dolly Sisters” at Loew’s Poli in Bridgeport, much like our past section,“The Beat." “The Mug” consisted of an article centered around a particular student and his interests. The very first “Mug” piece featured the Senior President of the Class of 1946, Ed Harkin, who was captain of the baseball team, played as varsity quarterback on the football team, and was well known for his striped sport coats, yellow socks, his "flashing smile and winning ways". "The Strop" was a section open for readers to air their opinions and observations in print, though the editors warned that "only constructive criticism and views will be accepted". Past issues of The Razor bear many similarities to our current publications, and included many of the same sections and elements such as "Sports", "Entertainment", and "News". Headlines such as "Traffic Trouble", "Hopkins-Hotchkiss Game", and "Our Next Mayor" pose as a window into student life at Hopkins at the emergence of the newspaper, though published nearly 75 years ago. The early articles of The Razor are located in the Calarco Library, and can be accessed by contacting Mr. Peters.